I had to send out a little post about this sweet boy. My sister nannies for his family and they created pumpkin decorations following the idea from my yarn apple craft I posted. He plans on making a DIY Victor costume from Frankenweenie for Halloween. 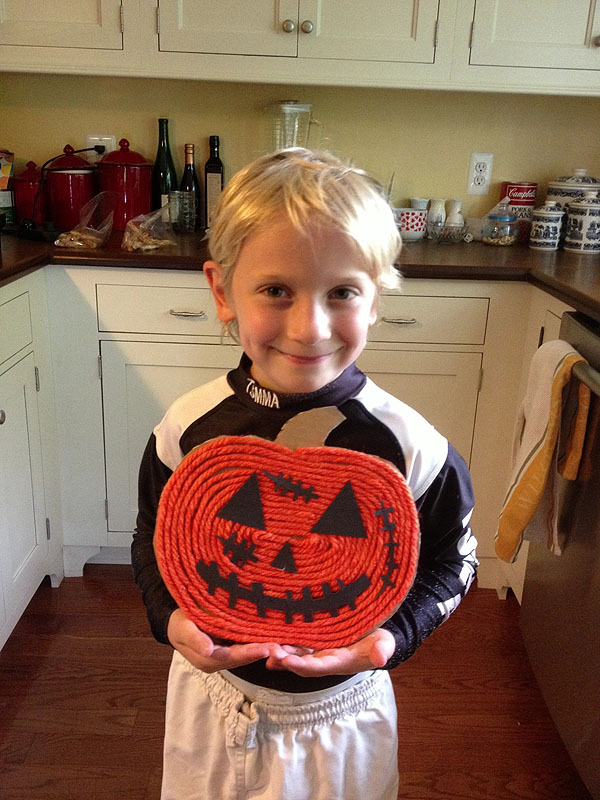 He made his yarn pumpkin craft into a zombie! Awesome! We have just recovered power after a 42 hour loss due to Hurricane Sandy. Our house is completely run on electricity but we did have running water. Trying to entertain six girls for that long was a frightening feat in itself! We managed with games, reading, carving pumpkins by candlelight, and lots of snacks and blanket forts. We had shelter, a fire to warm us, no damage to our property, and each other. What more could I ask for? We take everyday conveniences like a hot shower, clean laundry and food that won't spoil for granted. I am grateful for their return. I think we also take for granted the things we have all along, lying in wait. They are left unnoticed until forced upon us by lack of internet or television to entertain us. Things like playing a card game together, eating dinner by candlelight, or stepping outside to look at the beauty of an (almost full) moon lighting our dark, quiet neighborhood. Happy Halloween everyone! Stay safe! My thoughts go out to anyone still recovering from the storm.